We've known that Microsoft has big plans for its Google Now-style Cortana service, and those extend beyond Windows on both the phone and desktop. The company has finally shared when it intends to make good on those plans. A blog post says that Cortana (named for the female AI in the Halo series of shooters) will be coming to Android as a beta sometime in July. Windows 10, which will include Cortana for desktops and laptops, is scheduled to be released on July 29th. 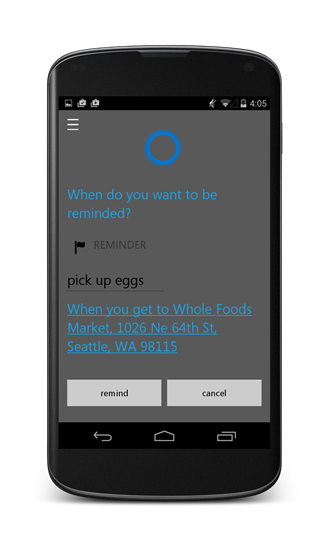 Microsoft says that the Android app will be "working as a companion to Cortana on your Windows 10 PC." Exactly what that means isn't clear, but it seems that Microsoft may limit Cortana on Android to Windows 10 users, at least initially. While Cortana performs much of the same web-connected functions as Google Now and Siri, the updated version will also perform duties specific to Microsoft's software ecosystem. On your Android phone you can ask Cortana to remind you to walk the dog at 8pm in the evening, and then when you’re watching a movie your Xbox will interrupt playback to let you know it’s time to take the dog out. Even in the early phone-only implementation, Cortana has been well-received by users - Microsoft's synthetic voice engine is arguably better than both Google's and Apple's attempts at human-like speech. Cortana's fully integrated capabilities, and how useful they'll be for users of non-Windows computers, remain to be seen.